Strawberries are in season now. Have you prepared anything using this or not yet this time ? 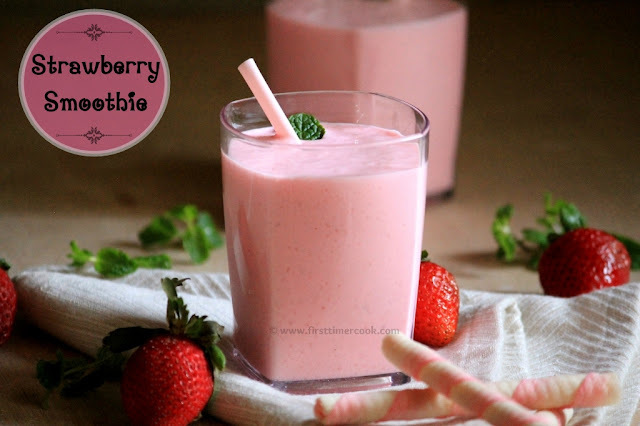 If not, then I have come up with a thick, creamy and delicious smoothie using strawberries which is prepared within 10 minutes and involves only 3 ingredients. Well among all variety of berries, strawberries are the most popular berry fruit in the world. But, yes this is a seasonal fruit. The juicy heart-shaped strawberries which is known as "Queen of Fruit" have much more to offer as health benefits beyond sweetness and flavor. As we know that any fruits, particularly berries and those with exotic colors are rich in antioxidants which means that they are huge boosters of our health. Strawberries are no exception to this rule too. In addition to this, strawberries are good source of a number of vitamins (like vitamin C, folate, potassium, manganese, dietary fiber and magnesium), minerals, antioxidants, flavonoids etc. and the presence of these compounds make this fruit very beneficial for our health. Along with strawberry, Greek yogurt is also used in this smoothie. Greek yogurt is nothing but a thicker, creamier version of regular yogurt. Greek yogurt is higher in protein and calories than regular yogurt. It's also lower in carbs and slightly lower in calcium. So if you are focusing for healthy diet, then just include Greek yogurt instead of regular / plain yogurt in diet. 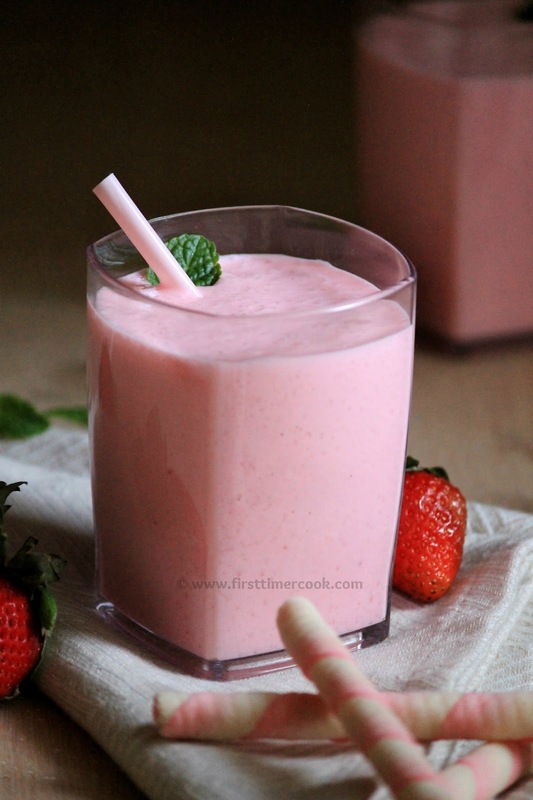 But still, the regular yogurt can be used to prepare this strawberry smoothie. The amount of honey can be totally omitted if the strawberries are so much ripe and sweet in taste. Making this healthy and nutritious strawberry smoothie is the best way to enjoy strawberries during this season. 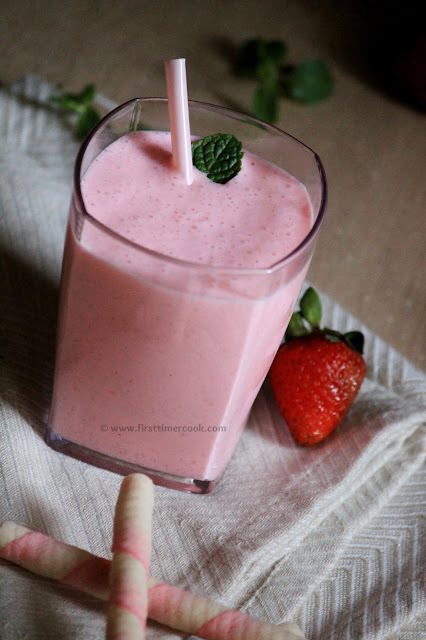 This refreshing strawberry smoothie takes only a few minutes to prepare and is ideal as a nourishing start to the day in an easy and delicious way. This is one of the easiest way to incorporate Greek yogurt into our diet. The high protein strawberry smoothie involves three ingredients and is a best choice during morning when there is hurry. This smoothie is a perfect breakfast drink and one healthy treat for kids too. 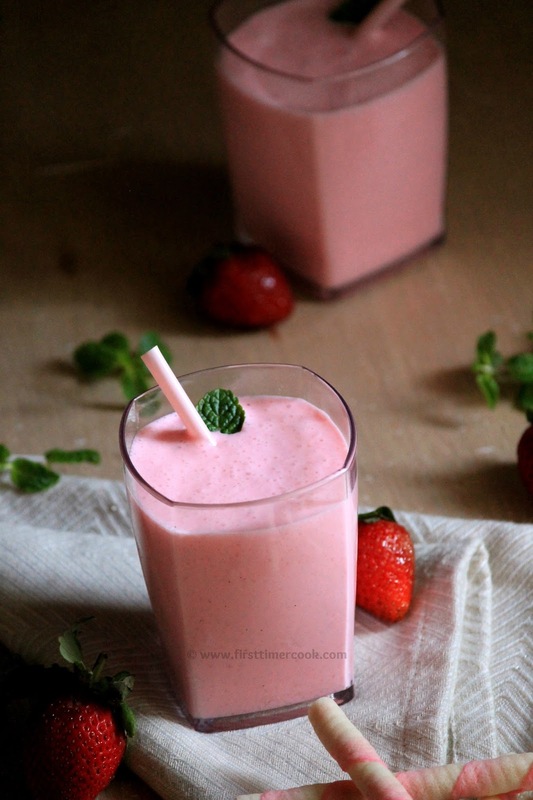 In any parties, also this strawberry smoothie can be served as a delicious and refreshing beverage. So below is the details method of preparation. Remove stems of the frozen strawberries if any present and then put in a blender jar. Add in Greek yogurt and honey. Blend everything until smooth puree consistency. Pour this prepared smoothie in serving glasses and serve immediately ! Sweetness is adjustable by varying the amount of honey depending upon the ripeness of strawberries. Since at our house we prefer the grainy and thick texture of the smoothie, so I have not strained the puree after blending. If any smooth texture needed, then just after blending strain the puree to get the desired texture of smoothie. 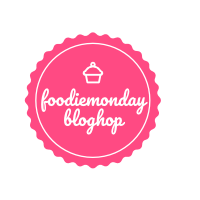 This 'Strawberry Smoothie' recipe is contributed for 128th Foodie Monday Blog Hop where the theme is '3 Ingredients Recipe'. 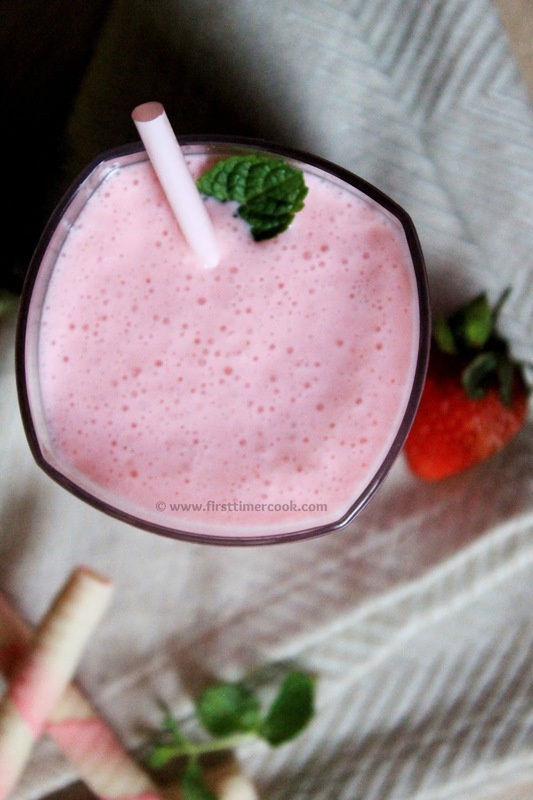 Love the baby pink color of this Strawberry smoothie ..awesome photography too !! Healthy, delicious, comfort food at its best! I found a great smoothie for breakfast..<3..thanks dear Sasmita! During my stay in Mumbai, have been having strawberry smoothie practically every day... so delicious. Lovely share for the theme. What a lovely colour and a healthy drink. Love this beautiful color of the Smoothie. Healthy and tempting share.